Ahmedabad: A government doctor has been arrested for allegedly performing caesarian in an intoxicated state leading to the death of a mother and newborn baby. With Gujarat being a dry state, the doctor is likely to face charges both under the Prohibition Act as well as relevant provisions of the IPC relating to negligence. The matter concerns 22-year old pregnant woman from Alampar village of Gadhda taluka who was admitted to Botad’s government-run Sonawala Hospital when she started feeling labour pain. The case was handled by Dr Paresh Lakhani who performed the caesarian operation on the pregnant lady. Few hours after the operation, the patient started bleeding profusely and the newborn was declared dead. The family members decided to shift the lady to a private gynaecologist, but she died on the way. 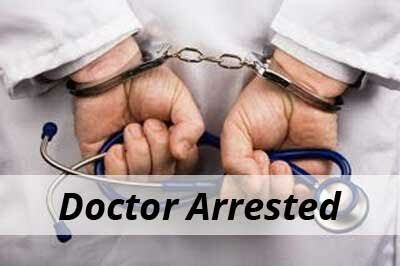 The family went to Dr Lakhani and found that he was drunk and had performed the operation in an intoxicated state. They immediately informed the police regarding the matter accusing him of medical negligence. The Botad Superintendent of Police Harshad Mehta informed the agency, “The police found that the doctor was drunk while on duty. He was first booked under the Prohibition Act and was arrested. His blood sample was sent for testing,” Mehta said. Under the law, Gujarat is a dry state. The patient’s body has been sent to Bhavnagar Civil Hospital for post-mortem and the autopsy report, as per rules, will be sent to a committee headed by the civil surgeon to examine and ascertain negligence on part of the accused, Mehta further added. Dr Lakhani, a 50-year old MBBS doctor, is the in-charge resident medical officer (RMO) is working at Sonavala Hospital for the last 15 years. Lakhani’s superiors and the District Development Officer have been intimated of his arrest as the accused is a Class II official, Mehta told the agency. “As per Supreme Court guidelines, only a committee headed by a civil surgeon can determine negligence charges. If the report is positive, we will book him under provisions of IPC related to negligence,” Mehta said. We must not jump to the conclusion that the doctor was guilty beyond doubt, as he was drunk and was a MBBS only. Nowadays relatives and friends become so furious after death in the hand of any doctors whether MBBS, MD or MCH that they can do any ultimate things. False implication is one of them. So friends, let the results of the committee come forward, then only decide whether the doctor is guilty or not. Secondly, there is no law forbidding an MBBS to do LSCS. Whether the doctor took alcohol before or after the operation? It\’s also to be noted, why the authority allowed an MBBS doctor to perform LUCS. Doctor who perform surgery can’t consume alcohol in view of post op complications!! ONLY MBBS can not venture into surgery . This is negligence . Cancel his medical professional license permanently ban his private practice aksonin future n put him on jail n finish the case within 6 months n hang him. Deceased MEMBERS family should be compensated high amount considering such un acceptable lapses in services which lead to death of 2 lives. Doctors payable by govt for his services should be paid to the deceased family. Bring strict law for permanently eliminating drunk people from all kind of services.